There is a home remedy for bladder infections which is promoted as being a quick and easy way to get rid of them - Baking Soda. It simple, effective, easy to get hold of and very cheap. The reason that I warn people about using it, comes from my own personal experiences in using it and similar products like Ural, antacids and club soda. Every time I have used a product like this I have gotten miraculously fast results. Within half an hour of taking it, it doesn't hurt to wee. Within a few hours and another couple of doses, I almost feel back to my usual self. I am cured! Or am I? Eventually I stop taking it - I am cured so no need to keep medicating myself. Soon my bladder infection is back and much much worse than before. Now I am doubled over in pain and my pee has gone from stinging before to full on bleeding razor blades. The problem with a home remedy for bladder infections like baking soda is that it can mask the symptoms so well you think you are better - even if the infection is getting worse. Baking Soda helps to make your urine more alkaline, which in itself is not a bad thing. By making the urine less acidic, the infected area is less irritated as the urine passes through it. A lot of the dietary changes I recommend involve creating a more alkaline environment in your body as well. But if you keep doing the things that caused the body to get infected in the first place your body is not going to have a chance to heal itself. Without something serious like antibiotics (which work to wipe out all bactera – good or bad) if you keep creating the environment for the bacteria to spread or grow... they will. They are opportunistic little creatures. I am not suggeting antibiotics are the only way – in fact I recommend avoiding them if at all possible. But if you keep creating a good environment for the bacteria to thrive and then dosing up with a remedy that masks the symptoms you can end up with a big problem on your hands. Untreated bladder infections can spread upwards to the kidneys where they can cause lasting damage and have serious health implications. Getting rid of a bladder infection fast is a much better option. As a home remedy for bladder infections, baking soda can work if you are aware of what it is good for and how to support it. Baking Soda, antacids or club soda can be a great way to relieve the pain of a bladder infection, just make sure that you are not relying on them to do more than they can. Used as a pain relief, while you support your body to heal itself, it can be ideal. Just becareful that you are getting better and not simply covering up the problem. Work on other things you can do to help your body to help itself while you get better. These include dietary changes, preventative measures and alternative treatments. 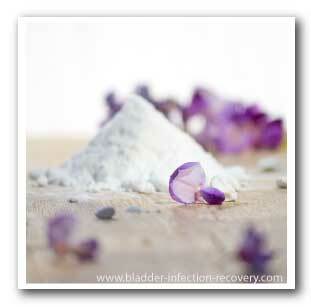 Read about other treatments and home remedy for bladder infections here.